Viet Nam received a record 12.9 million foreign visitors in 2017, a year-on-year increase of 29.1 per cent, according to the General Statistics Office (GSO). Visitors at Thoi Son Isle in southern Tien Giang Province. The number of European tourists to Viet Nam grew rapidly at an average of 20 -30 per cent per country, especially from the UK, Germany, France, Italy and Spain. Of the total, 10.9 million tourists arrived by plane while 1.8 million people came to Viet Nam on land. About 258,800 visitors came to the nation by seaway. The foreign tourists to Viet Nam this year included 9.7 million people from Asia, representing a year-on-year increase of 34.4 per cent. The country received 1.8 million people from Europe, 817,000 people from the Americas, 420,900 visitors from Australia, and 35,900 people from Africa. Visitors from China numbered 4 million, 48.6 per cent higher than last year, the office said. Deputy Prime Minister Vu Duc Dam said at a meeting of the State Steering Committee on Tourism on Tuesday that the strong results of the tourism industry this year contributed to the growth of the service sector and promoted the development of other sectors. The position of Viet Nam’s tourism industry also increased on the world market. Viet Nam ranked sixth in the 10 tourism destinations with the fastest development in the world in 2017, he said. In 2017, there were 73 million domestic travellers and total revenue from tourism activities was estimated at over VND510 trillion (US$22.4 billion). Dam said the strong growth in 2017 was partly due to positive changes in the tourism promotion activities of the Viet Nam National Administration of Tourism (VNAT). Enterprises participated in international trade fairs on tourism and implemented online tourism promotion activities, including via social networking sites. In addition, the pilot implementation of electronic visas for citizens of 40 countries into Viet Nam in early 2017 and visa exemption for citizens of five Western European countries were considered to increase the competitiveness in attracting foreign visitors, Nguyen Van Tuan, head of the VNAT said. 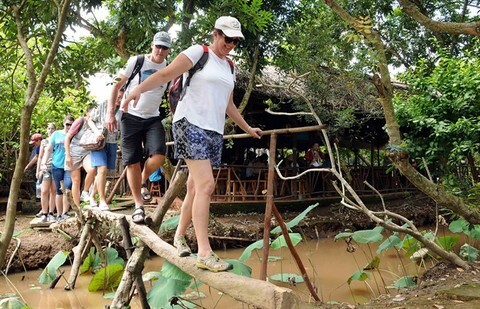 According to international travel companies, thanks to the visa exemption policy, the number of European tourists to Viet Nam grew rapidly at an average of 20 -30 per cent per country, especially from the UK, Germany, France, Italy and Spain. Tuan said the expansion of the visa exemption policy has been adopted by many countries. Countries that are competitive with Vietnamese tourism have a very open visa policy. International tourists to Viet Nam were also attracted by simplified entry procedures, shortening the time of licensing. Dam said the transport infrastructure and tourism environment have been improved although not as much as expected. Many modern and high-class tourism projects have been put into operation, improving the quality of tourism products. Nguyen Quoc Ky, general director of Vietravel, said another important factor is technology. International visitors are more active in finding travel information, room rates and air ticket services on the internet, helping them gain more information about Viet Nam’s tourism. However, the Deputy PM said Viet Nam’s tourism sector still lacks many things, from tourism products to accommodation facilities, tourism human resources, museums and theme parks. These will be key projects for the sector in the future. Dam asked the Ministry of Culture, Sports and Tourism and the tourism industry to focus on turning Viet Nam into a safe and friendly destination.